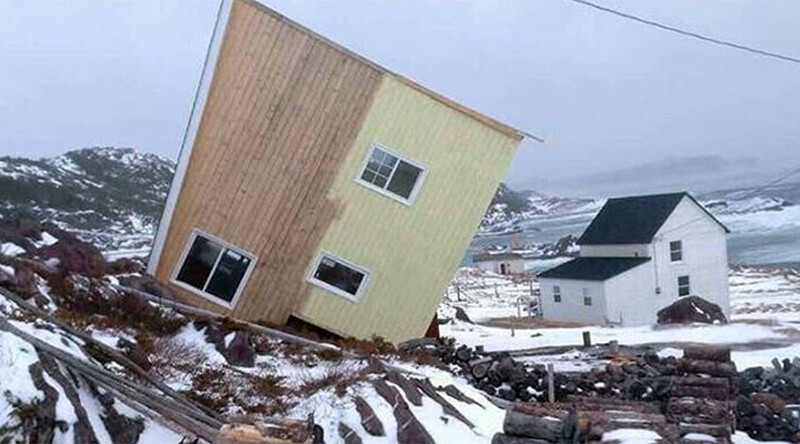 Residents of Newfoundland and Labrador have been assessing storm damage after “extreme winds” ripped roofs off buildings and totaled vehicles in the Canadian province. Canada’s most eastern province was hit by a brutal bout of weather on Saturday, with winds reaching speeds of up to 180 kilometres (112 miles) per hour at the storm’s peak. The harsh weather conditions were caused by a band of “intense” low pressure, according to Environment Canada. — RNC (Police) (@RNC_PoliceNL) 11 марта 2017 г. “The extreme winds on the back of this low brought extensive damage to much of eastern Newfoundland,” the government agency said. — Brian Walsh (@BWalshNL) 11 марта 2017 г. — Will Fowler (@thefutureyousee) 11 марта 2017 г. “Reports of damage include: power outages, tipped over trucks and trailers, siding and shingles ripped from buildings. In extreme cases, sheds, roofs, and the top floor to some houses were blown away,” it added. Blizzard warnings currently remain in place around Bay St George and the Corner Brook vicinity. — Earl Noble (@Noble41) 11 марта 2017 г. The hurricane force winds grounded flights at St John’s Airport, wreaking “havoc” on travel plans, the official Twitter account for the area’s major transport hub reported. — St. John's Airport (@stjohnsairport) 11 марта 2017 г. Residents of Newfoundland and Labrador have since taken to social media to post images of the destruction the storm left in its wake. — Christopher Smith (@cgsmithnf) 11 марта 2017 г. — Tracey Cook Taylor (@snoostorm) 11 марта 2017 г. — Phil Smith (@prsmith3x0) 11 марта 2017 г. — St. John's Racing (@GouldsRacetrack) 11 марта 2017 г.